Wouldn't it be wonderful if every gift we gave this holiday season also blessed someone else? World Vision gives us that opportunity. More than 250 items, starting at just $10, are available in their online gift catalog and in their print catalog to help improve quality of life for women, children, and families in the United States and around the world. 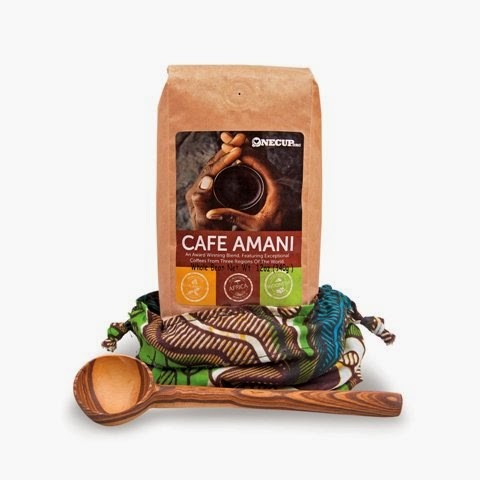 This Fair-Trade Coffee Set is blended by onecup.org and comes with 12oz of whole bean award-winning coffee beans from three international locations, a beautiful handstitched African fabric gift bag, and a gorgeous wooden coffee scoop. As a coffee-lover, I can attest that this is a wonderfully flavored coffee! World Vision also offers many other delectable gifts that will bless the recipient and the artist, like the Prosperity Cinnamon gift that includes 3oz of cinnamon in a carved bark box and the set of two hand-carved Olivewood Serving Spoons in a handsewn African gift bag. Visit www.worldvisiongifts.org to see their gifts ranging from $10 to $39,000 and find something that speaks to your heart. Follow them on Facebook and Twitter, then enter below to win the World Vision Fair-Trade Coffee Gift Set for yourself or someone you love! To enter, just fill in the Rafflecopter form below. You must be a US resident ages 18 and up. Only one entry is mandatory to enter; bonus entries increase your chance to win. Giveaway ends at midnight on 10/15/2014. Good luck! I learned that each dollar actually brings $1.15 worth of value to the communities they support. I learned that, for a gift as small as $25, you can provide $200 worth of necessities for needy women, children, and families in the U.S.! I like the Artisan Multi-colored Necklace. I like that you can choose a gift to donate in someone's honor. I love this agency and love the work they do around the world to bring love to these children. I love that you can donate a gift in honor of someone. Something I learned & liked - They work in nearly 100 countries, serving all people, regardless of religion, race, ethnicity, or gender. Choose a gift to donate in someone's honor which makes it such a wonderful gift for any occasion. I absolutely love that people in need can get goats and chickens, they are so valuable for people that need them. My husband and his children are in Honduras and they are so happy that they now have chickens to provide them with eggs and when they reproduce they are provided with meat. It is a huge help for them. I learned about World Vision’s water, sanitation, and hygiene (WASH) programming approaches the world’s challenges for safe water, improved sanitation, and good hygiene in an integrated manner to optimize the positive health and economic impacts. I learned that they promote micro loans for people to start up businesses. You can choose a gift to donate in someone's honor with a personalized greeting card. I learned that the gift of a goat and 2 chickens costs $100. I love the mission of World Vision. I have bought animals before to help a village be self sustaining. I love that there are so many different gifts that can be purchased. I do love that $114 does help 13 Small Farm Animals or any of the animals. You can sponsor a child for about $1 a day, and you'll provide children in need with access to life-saving basic needs. I love the micro loan program. I like that you can donate in someone's honor. I love the handcrafted gifts, especially the royal silk scarf. I love the colors of the necklaces. I really like the Artisan Multi-colored Necklace. I love that if you buy from there you not only get hand crafted quality items you are helping ! That is a win win! They have a unique gift catalog. Nice hand crafted items, and I can choose a gift in someones honor. I like the colors of Asia bracelet. I like the Kenyan Patchwork Tote. You can donate gifts in someones honor. I ike that you can donate in someone's name. I like that you can help set up a family with a small business to help them sustain their income. I like that you can choose to donate towards an animal which is a gift that keeps on giving! I like the Kenyan Patchwork Tote! I also like the world vision serving spoons. Beautiful! I learned that at World Vision you could donate to buy medical supplies or to purchase vaccines. I've long been a fan ~ admire and appreciate just about everything about World Vision: their concept, mission, methods and options. I love the way they can optimize your donation/gift for the highest value ($1 = $1.15, or for a gift as small as $25, you can provide $200 worth of necessities for needy women, children, and families in the U.S. and even direct your gift/donation toward specific needs: individuals, family ~ and even animals (for food or to help with farming...) Definitely mykind of organization. As far as handmade crafts go, I love the Balinese Multi-Strand Necklace, Kenyan Patchwork Tote and Colors of Asia Necklace & Bracelet or just give a donation to be given to the people/places most in need at the time. ALSO, for a gift as small as $25, you can provide $200 worth of necessities for needy women, children, and families in the U.S.! I learned that I can give a gift of a Goat and 2 Chickens for just $100. I really like the silver vines cuff, very pretty and I love handmade crafts from all over the world so there are lots of other things I like too! The Guatemalan headbands are nice, hubby is from Guatemala so anything to help out people from his country is great since I've seen firsthand the poverty there.